Now, can we get to the real problem? For most of 2011, national lawmakers in Washington, DC have invested what seems to have been the vast majority of their time, and our attention, on the need to get the debt ceiling raised and the nation’s revenues and expenses aligned. Meanwhile, the economy flounders because business executives in the United States, and increasingly globally, have little or no confidence in the direction or stability of the legal and economic arena. Uncertainty like that makes strategic investing in jobs and in job-creating expansion risky and seemingly unwise. The debt ceiling crisis is a symptom of a much more difficult problem, the mismatch between overspending and too little revenue. Political rhetoric out of Washington, DC is simply lip service meant to placate the itching ears of the electorate. Politicians have devolved into re-election machines focused on the next election cycle as soon as the last one is over. Most members of the U.S. House and Senate simply have no experience or education that would allow them to create effective policy for most of the topics they must address. So, with no basis for for developing, debating, and implementing effective solutions to the problems the nation needs them to address, elected and appointed decision makers in Washington seem inclined to simply parrot back the words the electorate and self-serving advisors and lobbyists beg them to say. A full 25% of elected members of the U.S. House of Representatives and Senate have no work experience outside of elected office. They get elected and re-elected because that is what they know how to do. 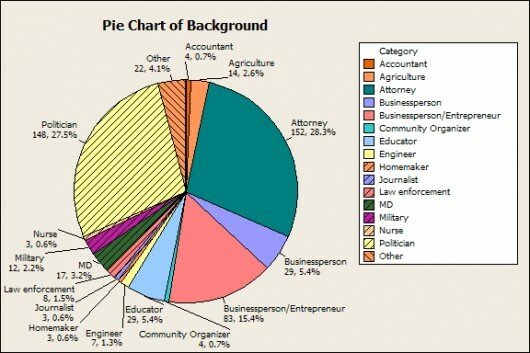 Another 25% are attorneys, but most of them know nothing about job creation and getting the economy moving, other than the potential knowledge and experience of legal matters related to employment and business expansion. Creating jobs and growing the economy requires one element missing from the U.S economy today; that missing link is the willingness to risk. The uncertainty created by the Washington bureaucratic machine is a consequence of a leadership void and the absence of a rudder and a keel for the ship of state and the barge of business. Until people in positions of leadership take the risk associated with actually leading, investors and business executives will continue to hoard cash and pursue hard assets rather than doing the dance they have all learned called entrepreneurship, innovation, and business and economic growth. Attempts at economic recovery may continue to prove comparatively fruitless in an environment lacking leadership and brimming over with uncertainty. passengers who travel with their children, and the realities of those parents who travel with their children. Sometimes, passengers who travel without their children simply act like children. Sometimes, a reality check is healthy, but we do not always see consensus on what reality is. defined and, more likely, hard to find at all. Pundits want to make the debate a Republican versus Democrat battle, but strong disagreement on a way forward seems just as present with each party as across party lines. Blog postings by colleagues of mine point out how many times the U.S. Congress raised the debt ceiling during presidential administrations dating back to Ronald Reagan, as if a history of doing anything is a compelling argument for continuing to do something. With that kind of thinking, as the current television commercial suggests, people would still think the world is flat (actually it says that without innovation the world would be flat – preposterous since it never was flat – but that is a topic for another day). agree that growth in the nation’s national debt cannot continue indefinitely, but we would find, and are observing, strong disagreement on how and when to resolve a potential debt crisis. Whether our representatives like it or not, they campaigned long and hard to be in the position in which they find themselves. Perhaps next time they will be careful what they ask for or, perhaps, we simply have the wrong people, collectively, in office. When I am flying, I must accept certain realities that are not necessarily included in the terms and conditions listed on the ticket. Reality 1: I am not in a position to charter my own plane and, as a consequence, I must accept that I am going to be on an airplane with other passengers. Reality 2: Sometimes my fellow passengers include children, and people who behave like children, and that is included in the price of admission. Reality 3: Sometimes when I am fortunate to sit in the big seats in the front of the plane, my fellow fortunates will include passengers with small children; that is not my opportunity to revert to childlike behavior myself. Reality 4: The parent of an unhappy child is not any more thrilled to be traveling with an unhappy child than I am and they have the added discomfort of having fellow passengers look at them as if there was something they should be doing to control the child. Looking at our elected representatives and their plethora of appointees, the electorate might find it refreshing to hear non-spun explanations of reality from politicians. Reality A: Non-spun, politically neutral explanations of anything are unlikely from anybody elected to public office in a nation’s capital. If the first responsibility of a leader is to define reality, as asserted by Max DePree, then if those we elect to leadership positions somehow refuse to define reality and to communicate a compelling vision for a new reality, the electorate in the United States may need to face Reality B. Reality B: Those who serve in elected office are not inherently leaders. Reality C: Not all people in elected office are public servants. Reality D: If e want people in elected office to lead us, we may need to elect leaders. Reality E: the leadership vacuum crosses party lines; the party only helps clarify the possible vision. It seems increasingly clear, facilitated by a potential crisis on the horizon, that the time is ripe for a leader to emerge. Will one? Washington, DC have a background suggesting experience in creating jobs. I raised the question because evidence indicating such experience seems thin after more than two years of conversation about economic recovery and the need to reduce unemployment through job creation. Since several people responded that I raised a good question and nobody seemed able to answer the question, I spent part of my 4th of July weekend reviewing the biographies of each member of the U.S. House of Representatives and Senate, as found at house.gov and senate.gov. 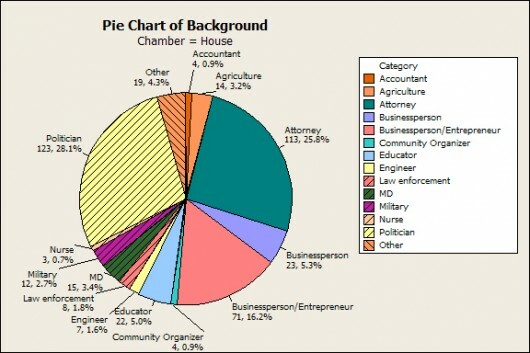 The chart below shows the combined number from both chambers. In these charts, I use the term “politician” to mean anybody whose indicated background includes only positions involved in negotiating and defining public policy or having no experience other than in those positions since 1980. I use the term “entrepreneur” to mean experience owning, building, or starting a small business. 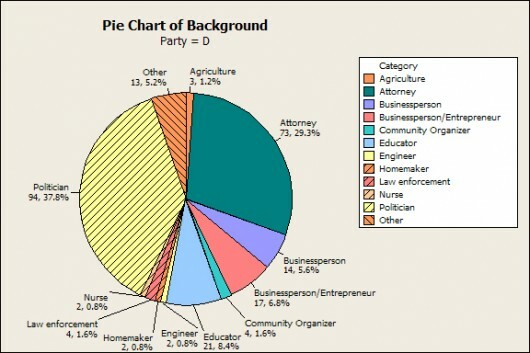 The data shows that 300 of 538 current officeholders in the House and Senate are almost equally divided between politicians and attorneys. 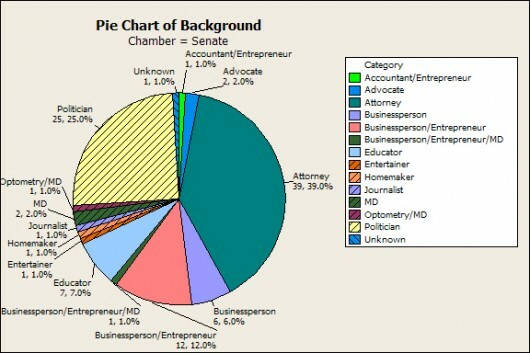 111 of our national legislators were businesspeople or entrepreneurs prior to election to public service and five more were accountants (one of which was also an entrepreneur); among the “Other” is one senator who was both a physician and an entrepreneur. Twenty were either physicians or nurses with two among the “Other” identified as dentists and one each of the “Other” an optometrist, a scientist, and a psychologist. Twenty-nine educators, eight engineers (one of which was also an entrepreneur), fourteen farmers, twelve members of the military, eight members of the law enforcement community, four community organizers, three homemakers, and three journalists round out the remaining non-“Other” legislators. The “Other” include a football player, ordained ministers, community organizers, communications professionals and journalists, an entertainer, a health administrator, an ironworker and a millworker. politicians view the world differently from attorneys who view the world differently from farmers and businesspeople and accountants and ministers. It seems that the question we should ask ourselves, before we cast our votes, is does this person have the worldview and the background necessary to solve our problems and do we need people to develop solutions or are we better served by people whose background is in policy or in law? I realize that the problems of today are not necessarily the problems of yesterday or of tomorrow, but would we be better served by staff who know how to write policy and legislators who know how to fix things and make things work? It appears that, when job creation and economic recovery is essential, we have too few elected leaders who have ever created jobs or stimulated a local or national economy and an abundance of people who should know how to negotiate and convince and write policies and laws. Does the United States have the right leadership with the right expertise? 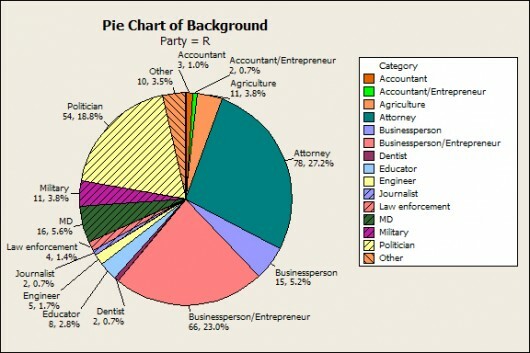 The following four pie charts show the breakdown for democrats and republicans and for each of the two chambers. I leave it to the reader to draw your own conclusions.